A sign at the Green Hills office reveals that Avenue Bank has taken the Pinnacle name. Following a merger, Avenue Bank officially changed its name and identity to Pinnacle Bank on Tuesday (Sept. 6), in a sign unveiling event at the combined firm’s Green Hills office. Clients from both firms will enjoy more benefits as a result of the integration, including the convenience of accessing an additional Nashville office at Cummins Station, as well as Pinnacle’s other locations in 14 counties across the state. Avenue Financial Holdings, Inc. (“Avenue”) was merged with Pinnacle Financial Partners, Inc. (“Pinnacle”) on July 1, 2016, giving the firm combined assets of more than $10.5 billion. In connection with the merger, Avenue Bank, Avenue’s wholly owned bank subsidiary, merged with and into Pinnacle Bank, Pinnacle’s wholly owned bank subsidiary. Avenue had continued to operate under its brand until the systems and operations of the companies were totally integrated with Pinnacle. 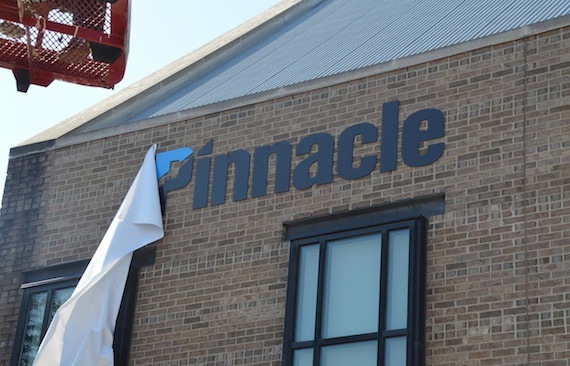 Pinnacle and Avenue announced the intent to merge on Jan. 28, 2016. Pinnacle Financial Partners provides a full range of banking, investment, trust, mortgage and insurance products and services designed for businesses and their owners and individuals interested in a comprehensive relationship with their financial institution. The American Banker recognized Pinnacle as the sixth best bank to work for in the country in 2016. The firm began operations in a single downtown Nashville location in October 2000 and has since grown to approximately $9.7 billion in assets at June 30, 2016. As the second-largest bank holding company headquartered in Tennessee, Pinnacle operates in the state’s four largest markets, Nashville, Memphis, Knoxville and Chattanooga, as well as several surrounding counties.